Written by Jeph Loeb; illustrated by Michael Turner. 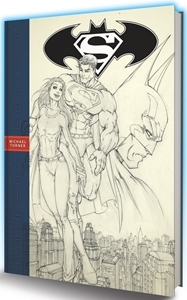 The art of comics legend Michael Turner is seen for the first time in it's original form in the new SUPERMAN/BATMAN: MICHAEL TURNER GALLERY EDITION. This spectacular new book collects the 'Supergirl' epic from SUPERMAN/BATMAN #8-13. Rounding out the book are numerous covers from IDENTITY CRISIS, JUSTICE LEAGUE OF AMERICA, THE FLASH and other DC Comics titles that helped establish Michael as an artistic force to be reckoned with. Graphitti Designs' Gallery Editions replicate the look, feel and attitude of the artwork. Every page is reproduced at original size on heavy paper stock to provide the fan and collector with museum quality reproductions obtainable nowhere else. This stunning Gallery Edition collects Michael Turner's work for DC Comics, reproduced directly from his uninked pencil art that was then enhanced and colored by the talented Peter Steigerwald. This format showcases Michael's art with all the subtleties and details that have never been captured in this fashion until now.